Over my four years at Stuyvesant High School in New York City, I had exactly three African American classmates. Although not as extreme, the demographic breakdown for the Class of 2019 profile highlights the racial disparity found throughout selective institutions and encompasses a much broader issue — the lack of opportunity available to those who need it the most. Affirmative action is a necessary tool for creating equal opportunity education for all races alike — not only for its historical background, but also for the implications it holds for the future. Affirmative action was enacted to accomplish the longer-term goals of the civil rights movement. Although the Civil Rights Act of 1964 sought to alleviate the struggles facing many African Americans, significant gaps in professional fields remained. This led President Lyndon B. Johnson to sign an executive order in 1965 for the usage of affirmative action programs to bridge these gaps. Decades later in 2011, 65 percent of African American high school graduates now immediately enroll in college, along with 63 percent of Hispanic graduates, compared to 69 percent of white students. We have made significant progress from 1964, where African Americans comprised only five percent of undergraduate students. Numbers aside, affirmative action is part of a legacy of progressive social action in the U.S. Racial tensions are one of the United States’ fundamental issues. Our nation’s history is irrevocably stained by slavery and its ramifications. Affirmative action is a solution — at least in part — to these problems. It provides the formerly-deprived with the opportunity to fulfill a version of the American dream. In addition to our unfortunate history of racial tension and struggle, the U.S. also has a tradition of academic excellence. 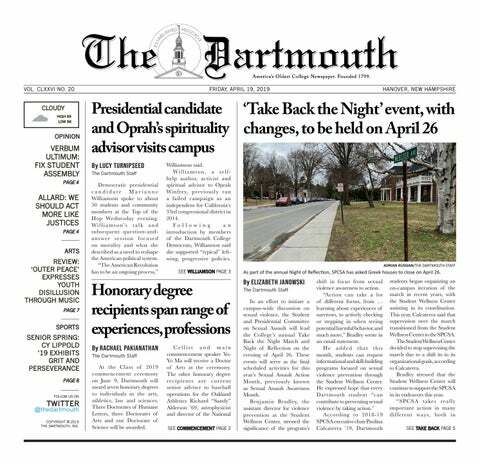 The Puritans brought to America a work ethic that allowed them to eventually thrive in the face of adversity and establish an educational foundation through the likes of Harvard and Yale Universities — not to mention our own home, Dartmouth. These institutions serve as pinnacles of global education even today. Given how important education is to the American tradition, it is only fitting that races that had been subjugated before can now have truly equal access to them. If more minority students are admitted to certain universities, students are more likely to interact with different races, avoid resorting to stereotype and gain a deeper understanding of different cultures and backgrounds. Moreover, studies demonstrate that race can correlate with socioeconomic class, so affirmative action positively affects both demographic spectrums. Whenever an affirmative action program has been eliminated from a university, minority enrollment has significantly decreased and led to a supermajority of one race. When affirmative action was removed from the University of California system, for example, the number of black first-year admitted students enrolled at its Berkeley campus declined by approximately 40 percent, while the percentage of Hispanic admitted students fell by almost the same amount. This was also the case at Rice University, where half the number of African American and almost one-third fewer Hispanic students were enrolled the immediate year after the elimination of affirmative action. The elimination of affirmative action in these universities has led to a rise in a racially homogenous culture that is misrepresentative of American society, which is a changing mosaic of various ethnic groups and socioeconomic classes. By actively seeking to include minorities, institutions serve to enrich the educational experience for all. Affirmative action programs have often been criticized for practicing unfair reverse discrimination and dismantling the ideals of a meritocracy. Since its inception during the Civil Rights era, however, affirmative action has done nothing more than to include those who have always been excluded from this very notion of meritocracy. Originally serving as a means to compensate for a history of racial injustices, affirmative action has transformed into an instrument to better prepare students for a dynamic and diverse society. Though Dartmouth has no known plans to abandon affirmative action, we clearly still have an issue with diversity. Roughly half of our campus self-identifies as white, and the recent switch to “need-aware” financial aid admissions for international students certainly does not inspire confidence. As a College, we cannot become complacent — we must remain vigilant in ensuring that Dartmouth is an inclusive and welcoming campus for all.